WHAT: After G.I. 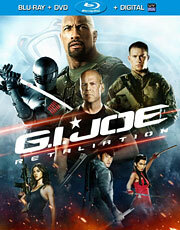 Joe operatives Roadblock (Dwayne Johnson), Snake Eyes (Ray Park), Lady Jaye (Adrianne Palicki) and Flint (D.J. Corona) are framed for a crime they didn’t commit, they must team up with the original Joe (Bruce Willis) to stop the terrorist group Cobra from assuming control of the U.S. government and clear their names. WHY: John M. Chu’s quasi-sequel to the 2009 flop, “G.I. Joe: Rise of the Cobra,” may be a slight improvement, but despite a clear passion for the source material (perhaps best illustrated by the faithful interpretation of Cobra Commander), it still suffers from equally bland action and a mediocre script. This is a property that has a ton of franchise potential, and yet time and again, Hollywood screws it up. In the case of “Retaliation,” it’s hampered by a clumsy attempt at acknowledging the events of its predecessor while also setting itself up as a reboot of sorts. But when you bring back some of the same characters, played by the same actors, it’s bound to create confusion. The small selection of Joes that Chu does have to work with is extremely limiting (especially with Channing Tatum’s Duke biting it in the first act), and as a result, the film lacks the personality that you’d expect from a series known for its colorful cast of characters. EXTRAS: There’s an eight-part making-of featurette titled “G.I. Joe: Declassified” that covers all the usual production details, an audio commentary with director John M. Chu and producer Lorenzo di Bonaventura, and a few deleted scenes. WHAT: Three childhood friends (Kate Bosworth, Lake Bell and Katie Aselton) reunite for a girls’ weekend on a remote island, only to learn that they’re not alone when they encounter a trio of military buddies hunting in the woods. After one of the guys is accidentally killed, the women are thrust into a fight for survival when the remaining soldiers target them for revenge. WHY: Katie Aselton’s follow-up to “The Freebie” has a fairly intriguing premise – a sort of female empowerment take on “Deliverance” – but it fails horribly in execution. 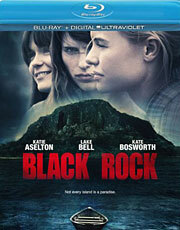 Though Aselton’s husband, actor Mark Duplass, is credited for writing the screenplay, “Black Rock” is another one of those semi-improvised mumblecore films where you can see the gears turning in the actors’ heads as they try to create the movie one scene at a time. Instead, the best that they can muster is a bunch of really awful dialogue, and that includes improv veterans like Aselton (“The League”) and Bell (“Children’s Hospital”). The other actors are hilariously bad (especially the main “villain” played by Jay Paulson), but the biggest issue plaguing this so-called thriller is that there isn’t a shred of suspense to be found. And with characters as dumb and shallow as the ones that appear in “Black Rock,” that’s not much of a surprise. EXTRAS: The single-disc release includes an audio commentary with co-stars Kate Bosworth and Lake Bell, a short making-of featurette and a behind-the-scenes look at scoring the film.